In the wake of the Global Crisis, some governments sought to stimulate demand through VAT cuts. This column assesses the success of these measures by investigating who benefited from a VAT cut on sit-down restaurant meals in France. The results show that restaurant owners captured the lions’ share of the tax cut, while employees and consumers benefited substantially less. Further, following subsequent tax increases, restaurant owners increased their prices by four to five times more than they had decreased their prices following the original cut. Value-added taxes (VATs) are the largest source of tax revenue on general consumption in the EU, where they raise revenues equal to 30% of total tax revenue or 12% of GDP. Their importance as a source of tax revenue has increased over time, and policymakers and academics have been increasingly interested in their incidence – that is, in who pays and who benefits from the VAT. However, mainly because of data limitations, empirical studies on tax incidence have provided limited evidence on the effects of VAT changes on outcomes other than prices (Carbonnier 2007, Politi and Mattos 2011). In addition, the empirical evidence has generally focused on specific reforms rather than providing evidence that can be generalised across countries and commodities (Kosonen 2015, Harju et al. 2017). In recent research, we evaluate the effect of a large VAT cut (from 19.6 to 5.5%) for sit-down restaurants in France, and disentangle the effect of the reform on consumers, restaurant employees, suppliers of material goods used to produce restaurant meals, and restaurant owners (Benzarti and Carloni 2017). We find that consumers benefited little from the VAT cut as prices of sit-down restaurant meals did not drop considerably, and that the main beneficiaries were restaurant owners. In related research, we focus on a large set of commodities and European countries for the period 1996-2015 and show that prices do not generally drop after VAT cuts while they usually increase after VAT increases (Benzarti et al. 2017). Our analysis focuses on the evolution of four main outcomes: prices, the cost of employees, the cost of material goods, and the return to owners (which includes profits). We evaluate the effect of the VAT cut by comparing these outcomes for sit-down restaurants and a control group, namely non-restaurant market services. Using a control group is necessary because there were non-tax factors affecting the restaurant industry at the time of the reform – importantly, France was entering a recession in 2009. We find that the VAT cut had a small effect on the price of sit-down restaurant meals, which decreased by only 1.4% in the month following the reform. The small decrease in prices persisted 30 months after the reform, when the price of sit-down restaurant meals was only 2% below prices in our control group. Notes: This figure plots the evolution of the prices of sit-down restaurants around the July 2009 reform and compares it to a hypothetical counterfactual had there been 100% pass-through of the VAT reduction. In addition, we provide evidence consistent with wages and salaries and the cost of material goods sold to restaurants increasing after the reform. Instead, we find that profits and the return to restaurant owners increased significantly. We document this increase in restaurants’ profits across both small and large restaurants, and across areas with varying levels of restaurant density, suggesting that competition did not directly affect the incidence of the VAT cut. However, we also find that new restaurants experienced larger profit increases compared to older restaurants, mainly because of lower wages. Notes: This figure shows how value added, cost of employees, return to capital, and profit and loss increased following the VAT reform relative to the control group. Overall, our findings suggest that sit-down restaurant owners were the main beneficiaries of the VAT cut – we estimate that 41% of the VAT cut was captured by restaurant owners, 25% by restaurant employees, 16% by the suppliers of material goods, and only 19% by consumers. These results are in contrast with the objectives set by the Contrat d’Avenir – a non-binding agreement between the French government and the representatives of the business associations of the restaurant sector that was signed three months before the reform. The agreement offered precise directives on how the tax cut should be used to benefit consumers, as well as to increase employment and investment, and suggested that the incidence of the VAT cut would need to be split equally between consumers, employees and owners of sit-down restaurants. Our estimates suggest that those goals were not fully achieved. The 2009 VAT cut for sit-down restaurants was followed by two VAT increases – one in 2012 and one in 2014. 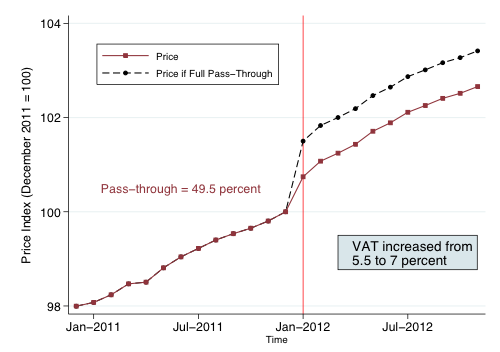 In January 2012, VAT increased from 5.5% to 7%, and prices increased by 0.75%, implying a 50% pass-through. In January 2014, the VAT rate increased from 7 to 10% and prices increased by 1.14%, implying a 38% pass-through. Notes: This figure plots the evolution of the prices of sit-down restaurants around the 2012 and 2014 reforms and compares it to a hypothetical counterfactual had there been 100% pass-through of the VAT increase. These estimates suggest that restaurant owners increased their prices following the VAT increase by four to five times more than they decreased their prices following the VAT decrease. Therefore, consumers benefited very little from the VAT decrease compared to restaurant owners, and paid for a significant fraction of the VAT increase. In related research, we show that business owners also received a benefit from VAT changes in other countries, and that the asymmetry in the pass-through of VAT changes for restaurants in France holds more generally across European countries. As an example, we find that when the VAT on hairdressing services in Finland was cut from 22% to 8% in January 2007, only 40% of the cut was passed through to consumers, while firm profits increased substantially. On the other hand, when the VAT rate was brought back to its original level in January of 2012, 79% of the VAT increase was passed through to consumers, producing only a small decrease in firm profits. 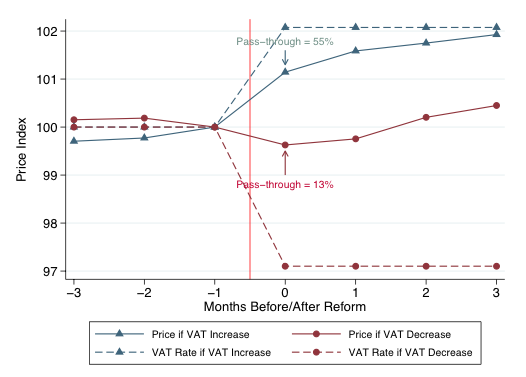 More generally, when analysing VAT changes across a large set of commodities and European countries over the 1996-2015 period, we show that the pass through of VAT changes to prices is asymmetric (Benzarti et al. 2017). 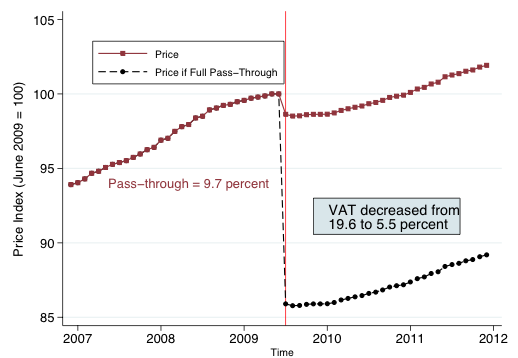 On average, the pass-through of VAT increases to prices is 55%, while that of VAT decreases is 13%. Notes: This figure aggregates all VAT changes that occurred in Europe from 1996 to 2015, and plots the response of prices to VAT increases versus VAT decreases. 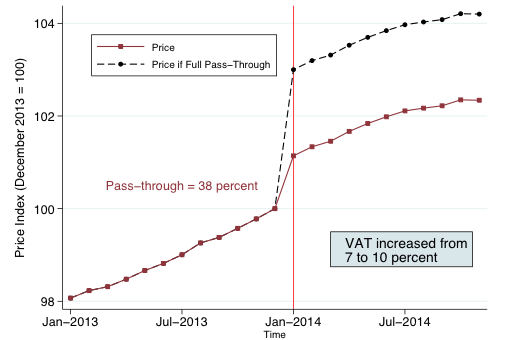 It shows that the pass-through of prices is larger for VAT increases than decreases. Because prices tend not to adjust downwards, our analysis suggests that VAT cuts are not an effective measure to stimulate consumer demand. In contrast, our evidence shows that VAT cuts are desirable if the goal is to stimulate supply by increasing profits of business owners. In addition, our findings imply that temporary VAT cuts that are reversed by equally large VAT increases can result in higher equilibrium prices that harm consumers. Finally, reduced VAT rates often apply to commodities that are necessities (such as food and medication) and are therefore consumed disproportionally more by low income households. The evidence we provide suggests that if VAT rates were reduced to benefit those households, this goal is not likely to be achieved, because of the limited pass-through to prices. Authors’ note: The views expressed in this column are the authors' and should not be interpreted as those of the CBO. Benzarti, Y and D Carloni (2017), “Who really benefits from consumption tax cuts? Evidence from a large VAT reform in France”, NBER, Working paper no w23848. Benzarti, Y, D Carloni, J Harju and T Kosonen (2017),”What goes up may not come down: asymmetric incidence of value-added taxes”, NBER, Working paper no w23849. Carbonnier, C (2007), "Who pays sales taxes? Evidence from French VAT reforms, 1987–1999", Journal of Public Economics 91(5): 1219-1229. Harju, J, T Kosonen and O Nordström Skans (2017), “Firm types, price-setting strategies, and consumption-tax incidence”, Working paper. Kosonen, T (2015), "More and cheaper haircuts after VAT cut? On the efficiency and incidence of service sector consumption taxes", Journal of Public Economics 131: 87-100. Politi, R B and E Mattos (2011), "Ad‐valorem tax incidence and after‐tax price adjustments: evidence from Brazilian basic basket food", Canadian Journal of Economics/Revue Canadienne d'économique 44(4): 1438-1470.